These homemade snickers bars might just be my new favorite thing. 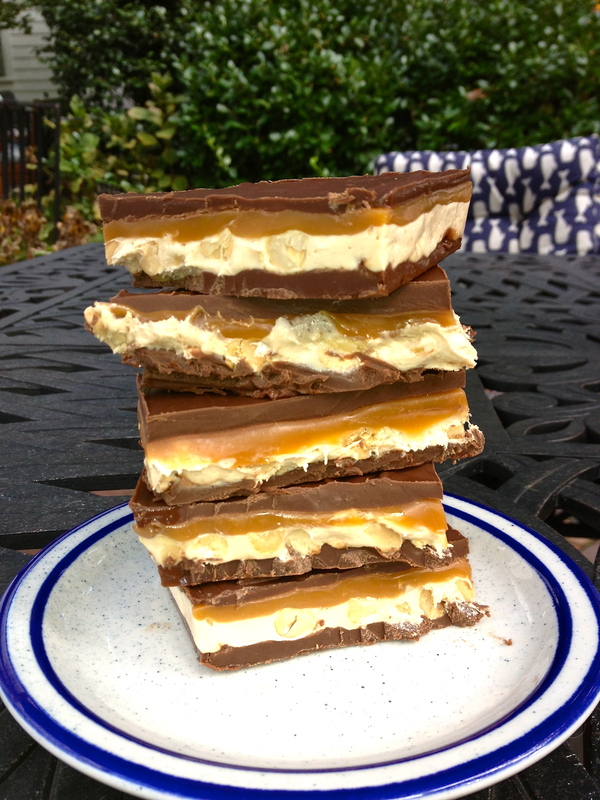 Store bought Snickers bars are all well and good- but these take it to a whole new level. They’re chocolaty and nutty and melt in your mouth- striking the perfect balance between salty and sweet. It looks like a lot of steps, and it is, but they come together pretty quickly and require minimal dexterity to execute. Either way- these bars are worth any amount of effort. Plan on eating one and then giving the rest to deserving friends, or you’ll risk eating the whole batch! Thoroughly grease you baking pan. Melt ingredients together in a saucepan over low heat, then pour into the baking dish and spread evenly. Let cool and harden completely. (I put mine in the freezer to speed up the process). Melt the butter in a saucepan over medium heat. Add in sugar and milk, stirring until dissolved, then bring to a boil. Allow the mixture to cook for 5 minutes, stirring occasionally. Add in fluff, peanut butter and vanilla, and whisk until smooth. Turn off the heat and fold in the peanuts, then pour over bottom chocolate layer. Let cool completely. (Again, you can use the freezer to speed it all up). Combine ingredients in a saucepan over low heat. Allow the caramels to melt, whisking occasionally, until smooth – this took about 10 minutes for me. Pour over nougat layer and let cool completely. Refrigerate for at least one hour before serving, or freeze for a good 15 minutes, then cut as desired. These can stay good at room temperature, but they do get gooey. If you keep them in the fridge, allow them to warm up a bit before serving. This entry was posted in Elizabeth Palmer Starnes, SCBD, Small Chick Big Deals and tagged chocolate, dessert by elizabethpalmer14. Bookmark the permalink. This sounds DELICIOUS! Saving this for next time I need a ridiculous dessert!